Work for glory box is almost finished! 2012 exhibition by tenmoregirls glory box is coming soon and I have nearly finished making. It has been another real learning experience. 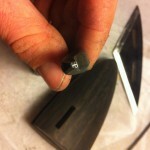 Carving ebony is an interesting but painful experience. I love ebony, its colour and texture but unfortunately ebony dust can make you feel very uncomfortable when inhaled. Even with good ventilation and dust mask on your face some small particles of dust always gets in. I find that whenI am working on the piece for a while this fine dust irritates my nose and throat and often skin on my hands too. For this reason I have decided that body of work for this exhibition will consist only three pieces. These three pieces are uniformed in shape and function but vary in minor design details.